It didn’t take the eagle eye of Bob Baffert long to zero in on Orb, who has flourished since arriving at Churchill Downs, and there is no doubt the son of Malibu Moon is moving in the right direction. 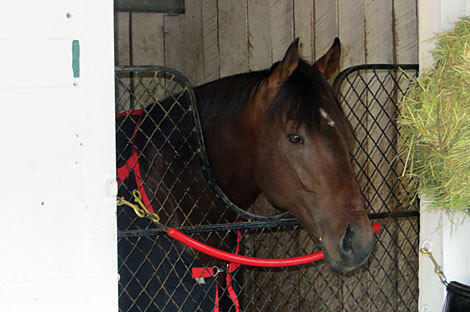 He has been alert and feeling good, yet seems settled and content, thanks in part to the constant TLC he’s been receiving by the Shug McGaughey team. From past experience at the Derby, when Baffert takes notice of a horse the way he did of Orb it is wise to pay attention. Not only did Orb have an exceptionally smooth gallop this morning, he demonstrated how good he feels by buck jumping coming down the stretch. One second he was moving along in perfect stride, and then out of nowhere, he leaped forward with his front legs while kicking back with his hind legs, and then calmly went about his business once again, galloping along smoothly. 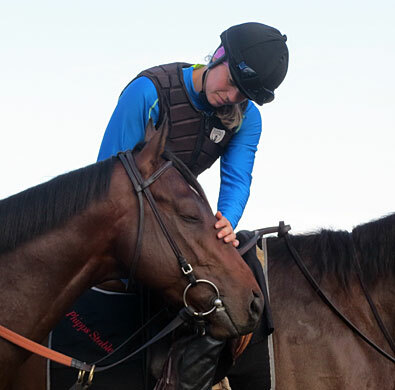 Each morning after entering the track, he stands at the rail for several minutes and just soaks it all up, while enjoying the affection lavished on him by Maureen Fisher on the pony and exercise rider Jennifer Patterson. He occasionally will close his eyes as if in total bliss. This column actually is a day early, as Orb is scheduled to work on Monday, but you can call this more of a lead-in to the work, which will be the headline grabber tomorrow. 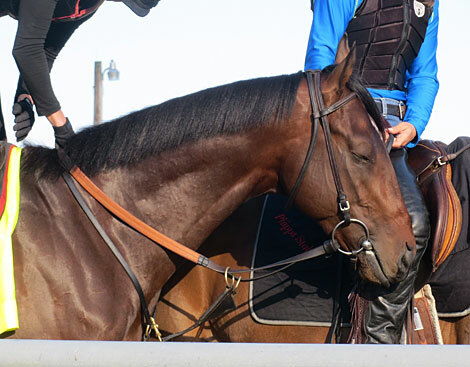 With so little activity today, it is a good time to focus on the Florida Derby and Fountain of Youth winner, and briefly discuss a horse who is showing all the signs you look for in a horse preparing for the Kentucky Derby. As for Baffert’s own Derby horses, he will have one, two or none. He worked Code West in company with Midnight Lucky this morning, and although the gray tigress once again got the better of her male workmate, this time by only a half-length, Baffert was happy with the way the colt went, and is willing to excuse his uncharacteristically dull effort in the Louisiana Derby. A decision will be made tomorrow after talking with owner Gary West and racing manager Ben Glass. The alternative would be to wait for the Preakness or the Peter Pan and then the Belmont. It would seem the Peter Pan would be the most likely, but it is up in the air right now. The son of Lemon Drop Kid, like his sire, is a grinder who goes along at one pace and just keeps going. He would seem like an ideal Belmont horse. In today’s work, Code West went five furlongs in 1:00 2/5, out six panels in a brisk 1:12 3/5. He came home his final eighth in a sharp :11 3/5. He can thank Midnight Lucky to some degree for contributing to the time of the work. She carries you along pretty good and you had better motor along if you want to keep up with her. Baffert’s other Derby possibility, Govenor Charlie, is scheduled to work tomorrow and a decision will be made following the work. The son of Midnight Lute did have a brief physical setback and was sent to Rood & Riddle for a complete bone scan, which came up negative. Although his issues are behind him, Baffert is a bit concerned about the training the colt lost. He’s only had three lifetime starts, and only one horse, Big Brown, has won the Derby with so few starts in the past 98 years. If Govenor Charlie doesn’t run in the Derby, there is a good possibility he’ll go in the Preakness instead. Govenor’s Charlie’s gallop today actually was the best he’s had, at least of the ones we’ve seen. He was moving with more authority and had better extension to his stride. He had not been showing much extension at all in his previous gallops. Two new arrivals who took to the track for the first time today were Goldencents and Itsmyluckyday, and both looked great great. Goldencents is an eye catcher and once again was accompanied by a full Team O’Neill entourage that included assistant Leandro Mora and jockey Kevin Krigger, along with Krigger’s father, and his agent, Tom Knust. There is a great deal of confidence being exuded by everyone associated with the son of Into Mischief. 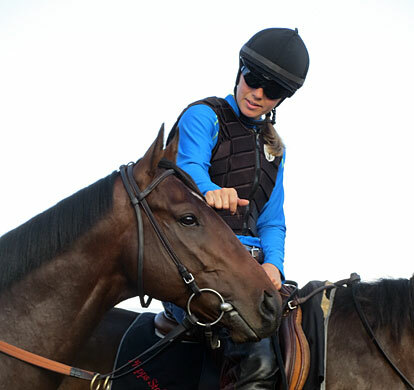 Itsmyluckyday just jogged around the track, but looked as if he owned the place and had been there his whole life. He strutted along with his neck slightly arched in regal splendor and just made a terrific appearance. 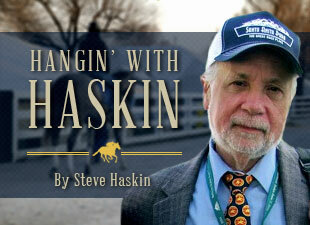 For a horse who has accomplished as much as he has, expect him to be a mouth-watering price on Derby Day. 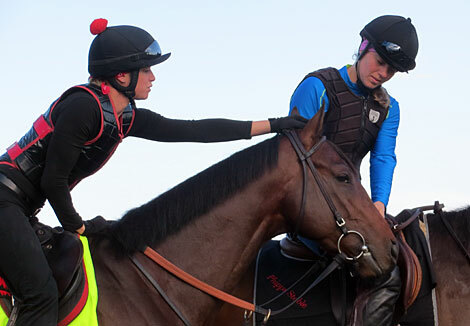 In addition to Orb and Govenor Charlie, tomorrow’s workers will include the Wayne Lukas pair of Oxbow and Will Take Charge, and the Todd Pletcher-trained Winning Cause, winner of the Lexington Stakes, whose Derby status will be determined by the work. It looks as if Tiz a Minister will be headed to Kentucky following his third-place finish, beaten 4 1/2 lengths, in the Snow Chief Stakes at Hollywood Park. The big horse on the grounds still waiting to secure a berth in the Derby is the Dallas Stewart-trained Golden Soul, a fast-closing fourth in the Louisiana Derby.